A very quick and versatile hitch to attach all sorts of tree climbing things, from throw bags to branches. Make sure that ends exit on opposite sides of the hitch and that it is symmetrical. 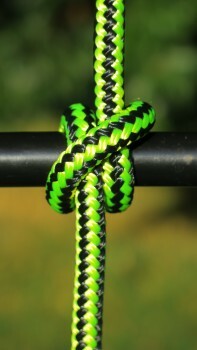 If there is a descent amount of weight involved then back up the clove hitch with two half hitches.